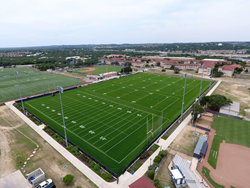 Schools use the term multipurpose a lot when referring to their playing fields but UTSA has taken it to a new level with the design of their new AstroTurf recreational fields. The 248,430 square feet of premium synthetic turf has been carefully and skillfully designed to accommodate everything from Football to Rugby to Lacrosse and more. At first glance of UTSA’s new recreational fields it appears that there are just four fields lined up side by side but a closer look reveals much more. One field stands alone as a football practice field for the Roadrunners but the other three are lined to accommodate multiple sports. The layout of flag football fields can handle 6 games at once and the lines for soccer allows for three matches to be played at the same time. Markings that are specific to women’s lacrosse also appear within this framework. While all these fields run vertical, other sport specific boundaries run horizontal across the fields. Men’s Lacrosse and Rugby take up the width of the three fields. With so many lines running in different directions it was important to differentiate the field of play for the sports. AstroTurf was able to conquer that issue by making the field lines a different color for each sport. Football lines appear in white, Soccer lines are crimson, Men’s Lacrosse lines are bright blue, orange lines for Women’s Lacrosse, and black lines for Rugby. With careful scheduling, many different Roadrunner sports will be able to be played weekly on this new surface. With so much activity on the rec fields of UTSA, it was important for them to choose a surface that would stand up to the rigorous activity occurring at the facility each week. They chose wisely by selecting AstroTurf’s RootZone 3D3 Blend of synthetic turf. This is a premium product that combines slit film and monofilament fibers for optimum durability and structural integrity. It also features AstroTurf’s patented RootZone sub-layer, a texturized fiber that stabilizes the infill. All of these elements combine to deliver an aesthetically pleasing playing surface that’s high on durability, safety and performance. The Roadrunners football team is already very familiar with AstroTurf as they play their home games on the same type of RootZone 3D3 field in the Alamodome. UTSA competes in Conference USA and with a total capacity of 65,000, the Alamodome is currently the second largest football stadium in the conference. For athletes and sport enthusiasts, AstroTurf® has redefined the way the game is played. The brand offers advanced, state-of-the-art, multi-sport and specialized synthetic turf systems with proprietary engineered technologies. A growing number of high schools, colleges, professional sports teams and municipalities continue to select AstroTurf-branded products for their premium quality, technical superiority, and safety. To learn more, visit AstroTurf’s website at http://www.astroturf.com.